The thousands who drive north through the Blackwall Tunnel every day probably never give a second glance to a building to their left – a shop selling electrical and motor spares. Curiously, among the signs on the outside is one more familiar on the front of a pub – a Whitbread jug. 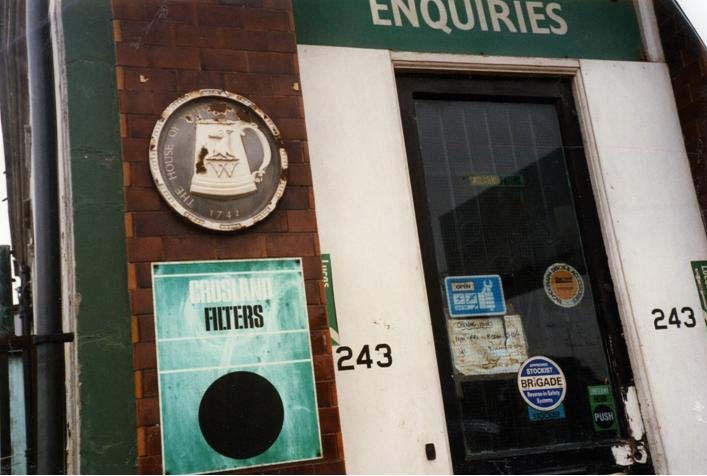 This sign had also escaped the attention of the shop assistants since – when I asked to take a photograph of the premises – they were unaware that their workplace was an old pub! But more of that later. There were a number of pubs on Greenwich Marsh, which have closed and disappeared since housing was demolished and factories closed. One of them was on the riverside – but its final closure was in Second World War bombing. I imagine that if it had not been destroyed in the war, today, like other riverside pubs, it would be a popular venue and crowded out all the time! Its site is, however, now part of a local factory. This was the Sea Witch. I had become interested in the Sea Witch while researching the development of the riverside and its industries near the Dome site. To my surprise I found that it was not an old, ‘traditional’ pub at all, but built in the Victorian era – and I also became fascinated by the name – why Sea Witch? While I am not sure I have found the answer to that question, the attempt to find out has led me to some interesting conclusions. This part of the Greenwich riverside was owned by the Blackheath-based charity, Morden College. The College – in fact an almshouse and old people’s home – was founded in the late seventeenth century by Sir John Morden. The residents still live in the elegant building Wren-designed for Sir John on the south west corner of Blackheath. In order to fund the charity Sir John endowed it with land. Most of this land is in Greenwich but other places where Morden had, or has, an interest, include Chatham and Chislehurst. Since the College was set up land has been sold, and bought, so that there have been some changes. In the early part of the nineteenth century the College’s trustees took a decision to develop the western riverside area of Greenwich Marsh for industry. In the late 1830s parcels of land were let out to industrialists who had a remit to build wharves, houses and to sub-let where appropriate. One of these developers was a Charles Thomas Holcombe. I do not know very much about Charles Holcombe. He seems to have had considerable land holdings in south London – including New Cross. He might be the Charles Holcombe who was married in Deptford in 1820. What I do know is that by 1838 he was sufficiently rich to buy Valentine’s House in Essex. The ‘Valentine’s’ estate is now a large public park near llford and Holcombe’s great house is now standing semi-derelict while Redbridge Council tries to find a use for it. Holcombe also sometimes gave an address in the Paddington area, in Porchester Terrace. He first became involved in Greenwich Marsh as a partner in a tar distillery owned by a John Bryan and when Bryan became bankrupt he took over the site himself. In 1846 he is listed in trade directories as a tar manufacturer – but I doubt that this entirely reflects what his actual source of income and business really was. Sea Witch shown on Mr. Holcombe’s site c.1865. The directory entry gives an address in the City of London and ‘Morden Wharf’ – one of the earliest indications of that name for a part of the Greenwich riverside. Morden College leased the area, then known as ‘The Great Pitts’, to Holcombe in 1841. Within a few years he had built a chemical works and houses there. It is a matter of speculation as to whether the term ‘house’ might refer to a pub or not. However there is no indication that the Sea Witch was built as early as the 1840s but a pub stood somewhere nearby at ‘the corner of Morden Place, near Morden Wharf’. This was called the Morden Castle and was advertised for sale in 1849 as an ‘Ale and Stout House’. There is no other information about the Morden Castle and it could have been the Sea Witch under a different name, or an entirely different establishment. I n 1850 it was reported to Morden College that a pub had been built on Mr Holcombe’s land – soon to be followed by a chapel and more houses. In 1852 Morden College passed a great deal of this area from Holcombe to James Soames – and this almost certainly included the area around the pub. James Soames was the active partner in Wilkie and Soames Thames Soap Works. They were to stay on this site until taken over and closed by Unilever in the twentieth century. The site is today occupied by Amylum, the business still known locally by its old name of Tunnel Glucose. The pub itself seems to have been retained by Holcombe, although this is not entirely clear. Sea Witch therefore seems to have been built as part of a development of houses and factories on the Greenwich riverfront. It stood on the riverbank at the end of Morden Wharf Road – once also known as Sea Witch Lane – which runs from Blackwall Lane down into the area of the Amylum glucose refinery. Amylum have closed the end of the road and it is no longer possible to use it to access the river – a large padlocked steel gate now blocks the way. The site of the pub appears to be that of the laboratory block, and the patterns of windows eerily echo the front of the pub as shown in the only known photograph of it. A plan, which dates from 1879, shows that at one time it had a garden on the riverside with the still existing river- side path between it and the pub itself. It may be also that some parts of the property were on both sides of Morden Wharf Road. At the back of the pub were a ‘pot house’ and a ‘wash house’. At that time it seems to have been a tied house for Gurney Hanbury of Camberwell but the 1937 photographs show it as a Whitbread House. An ‘ancient lights’ sign on the front must have been to guarantee the river view. The 1937 photograph has some other more telling signs. There is a gas street light outside the pub – something which would be very welcome on what is an almost totally unlit path today, but its main purpose was to light the causeway here. 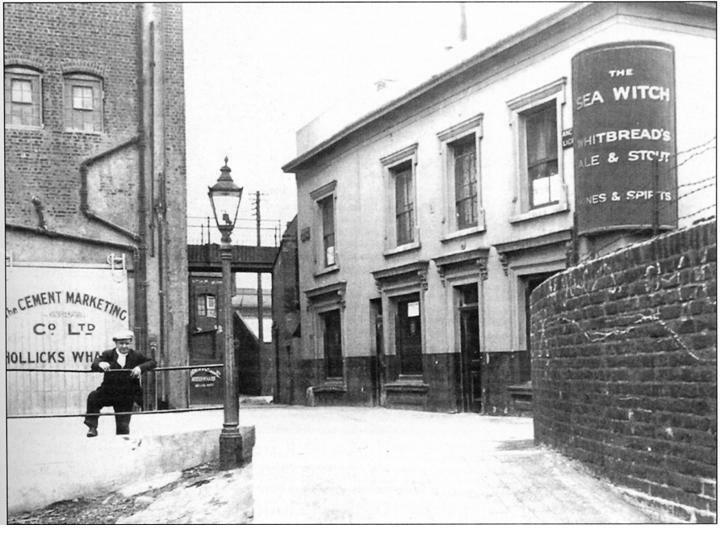 Alongside the pub is shown the Cement Market Company’s gate to Hollick’s Wharf – and Jabez Hollick was one of Holcombe’s tenants in the early 1850s. Further on is the gate to Morden Wharf. It certainly looks to be, even for that period, a very down- market boozer indeed. The figure in front, replete with cap and white muffler, hardly helps the scene. 1937 looks more like 1907 to me! Further research led me to speculate on the name Sea Witch. If you type ‘Sea Witch’ into the internet you will almost certainly pick up ‘Project Sea Witch’ in America (http://www.maritime.org/conf/conf-smith.htm). This describes a project to rebuild the famous American Clipper Ship designed by John W. Griffiths and launched by Smith and Dimon for William Aspinwall in New York in 1846. Sea Witch was a very dramatic and important ship. She was built to a revolutionary design in order to be a ‘World Beater’. She was 907 tons and her figurehead was a Chinese dragon, her hull was painted black and all her spars were ‘bright work’ (scraped and varnished wood). On her first trip in December 1846 she sailed from New York to Hong Kong in 104 days, and in 1847 from Whampoa to New York in 77 days – the fastest passage on record. It is very clear to see that she would have been in the news in 1850 at the time the Greenwich pub was named. It is heartening to see that the designers of her replica have every intention of bringing their new ship to ‘historic Thames river’ to pay their respects, at least, to the Cutty Sark. The trouble is that I am not really sure that the pub was named after this ship – however famous she was. For there was another 5ea Witch – a British vessel built locally at almost the same date. This Sea Witch was built at Blackwall Yard – almost within sight of the pub. I am afraid that since she was not nearly so famous, it is not nearly to easy to find information about her – let alone the pictures and web sites dedicated to her American cousin. She was only 410 tons but had a much longer life. The American ship was wrecked off Havana in 1856 while ‘our’ Sea Witch lasted until 1882 when she was hulked. Like the American ship she was fast and in 1848 had returned to London from Woosung in 115 days – the fastest time that year and a record which stood for the next five years. There is another similarity between the two ships in that they followed the same trade. Both were built as ‘opium clippers’ – that is, built to take opium to China and return with tea, silk and other commodities. The trade is well known and a number of books and a recent film have described it – one of the least reputable ways in which a lot of money was made in the nineteenth century. In an earlier article on the Blakeley Ordnance Works on Greenwich Marsh I described how Blakeley had been financed by members of the China House of Dent – one of the most prominent of the opium traders, many of which family lived in Blackheath, Lee and Bromley. The British Sea Witch was built for a Mr Braine. He was another very rich man living in one of the villas in Regent’s Park. I am not surprised to learn that he was at that time Chairman of the China House of Dent. If the pub was called after the British clipper. Sea Witch, then what was Mr Holcombe’s interest in the ship? Is it perhaps one of the reasons that he was rich enough to buy Valentine’s Park at a relatively young age? Of course all of this is pure speculation. It is just as likely that Mr Holcombe, the brewer, or someone entirely different liked the name Sea Witch and had picked it up from a fairy story, or a picture – or any one of a number of other reasons. There is just one other thing. I started this article talking about another pub. That was the one that stands alongside the Blackwall Tunnel approach road and is now an electrical shop. It was called ‘Star in the East’. I do not know who built it, and I doubt the present building is the original, anyway. The pub was certainly there in 1865 when it was advertised for sale as a ‘Public House and Spirit Stores’. In 1898 the landlord was fined when the court heard a number of conflicting stories concerning an Ellen Pope who had drunk too much gin and bitters. The magistrate had accepted the police version that the landlord had served a drunken person. Was the Star in the East anything to do with Sea Witch? I do not know but I thought you might like to know that another ship was built at Blackwall Yard soon after Sea Witch, also for the opium trade in 1850. She was called Star in the East – of course! Hi, this pub was run by my family and have photo’s and a poem about the pub, let me know if you want to know more. Hi My Great Great Grandfather was Richard Beach. His Son Thomas and the family were Land lords of the Sea Witch from 1867 through 1871(Census) Not sure how long they stayed but Richard’s youngest son Ben ended up with many pubs through London in ensuing years-most with family members helping out. I have often wondered what the pub was like then-Richard probably died there.